The euro surged ahead to a fresh 6-month high earlier this morning as the price was seen trading above $1.1150. The gains came about as the US dollar index weakened significantly since last Friday, while data from the eurozone turned encouraging. Latest inflation figures confirmed yesterday that the Eurozone's consumer price index rose 1.9% on the headline and 1.2% on the core, validating the preliminary inflation reports. In the United States, lack of any economic data saw investors focus on the political developments from Washington. In the UK, the latest monthly jobs report saw the UK's unemployment rate falling to a 42-year low at 4.6% in the periods between January and March 2017. Wages also posted a modest increase, rising from 2.3% previously to 2.4% and matching estimates. Looking ahead, the economic data today turns to the weekly unemployment claims and the Philly Fed manufacturing index. Earlier in the day, the Australian jobs report saw the unemployment rate falling to 5.7%. EURUSD (1.1145): EURUSD rose nearly 0.6% yesterday as price breached the 1.1150 level quite comfortably. The EURUSD is now into four days of a strong bull rally as the price was seen testing the resistance level at 1.1150 from late last year. On the weekly chart, EURUSD is seen posting a hidden bearish divergence, while on the daily chart we have a bearish divergence on the Stochastics posting a lower high. This potentially indicates that a correction could be on its way, provided that EURUSD can break down below 1.1100. Failure to do so could keep the bullish momentum intact and keep prices on track to test 1.1200. AUDUSD (0.7459): The Australian dollar is now into its seventh day of gains, well supported by a better than expected jobs report earlier today and a weaker US dollar. 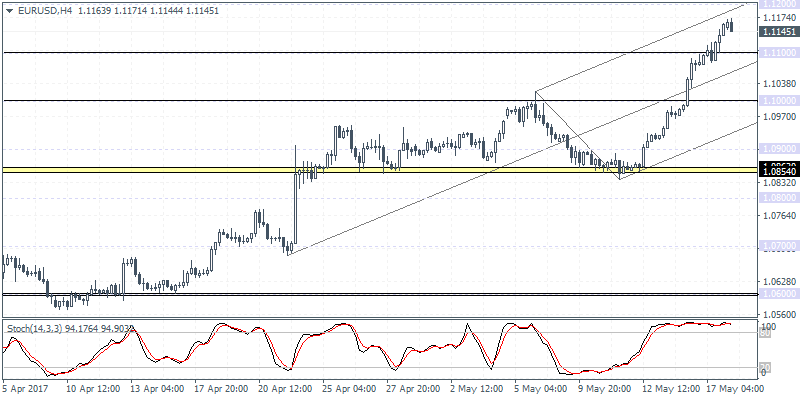 Price is seen testing the lows from late April at 0.7465. 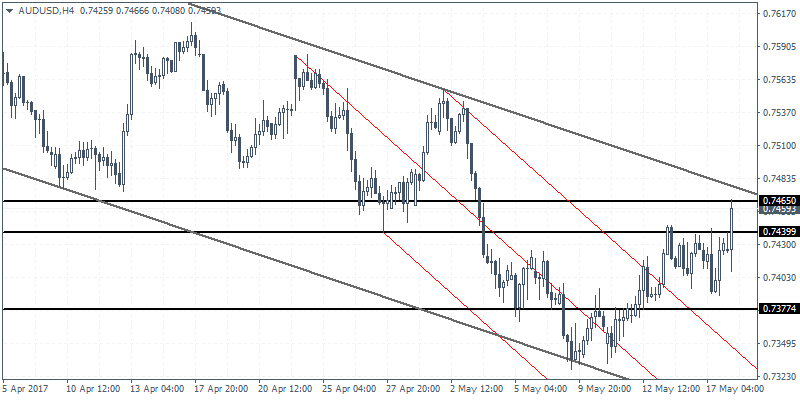 There is currently a confluence of resistance level and the dynamic trend line from the falling price channel at 0.7465 which could potentially signal the end of the correction. Support at 0.7377 remains to be tested to the downside, while to the upside a breakout above 0.7465 is essential to keep prices to push higher. GBPUSD (1.2966): The British pound continues to remain muted but well supported above 1.2800. 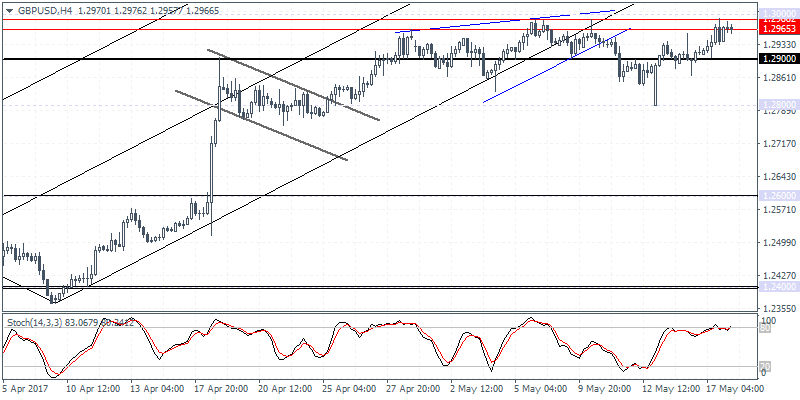 Price action was seen testing the resistance level at 1.2988 - 1.2965 region which was previously tested just last week. Another failure to break out above this resistance level could imply a move back to the downside with 1.2800 support coming back into the picture. On the daily chart, there is a strong indication of a downside correction towards 1.2600 on the bearish divergence to the Stochastics. However, a close below 1.2911 is required to confirm this view. Coming up later today will be the retail sales figures which are expected to see a gain of 1.2%, partly offsetting last month’s declines of 1.8%. In the past 24 hours Bitcoin has lost -1.24% and reached $5270.16305518. Open your trading account with the best cryptocurrency brokers on special terms today.